Congratulations to PhD student Faheem Maqbool. His new publication on how supercritical carbon dioxide can be used to efficiently produce and load liposomes with drugs has been published online in Artificial Cells, Nanomedicine, and Biotechnology. Congratulations to PhD student Zhenghui Xu on the acceptance and publication of his review ‘bioconjugation approaches to produce subunit vaccines composed of protein or peptide antigens and covalently attached toll-like receptor ligands‘ in the ACS journal Bioconjugate Chemistry. Congratulations to Dr Yu Wan, who has successfully completed her requirements to be awarded a Doctor of Philosophy (PhD) from the University of Queensland on the 7th of July 2017. Best wishes for your future career endeavours. Read our new article on “biotechnology approaches to produce potent, self-adjuvanting antigen-adjuvant fusion protein subunit vaccines” in Biotechnology Advances (IF 9.848). 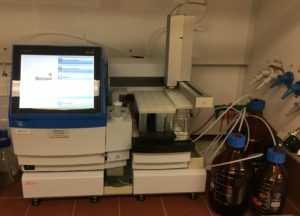 We have recently received a Biotage Initiator+ Alstra automated microwave peptide synthesiser, which will provide rapid, safe, and high quality peptides for student projects in the school of pharmacy courtesy of the UQ Major Equipment Infrastructure grants. Feel free to contact us if you are interested in using this instrument. Congratulations to Eloise Lloyd, James Stephanie, Joey Cheng and Merhawi Asfha for completing their Major project assessments. Congratulations Anjuman Begum on the acceptance of your first paper from your PhD.